You are currently browsing the Bringing Jerry Zimmer Home blog archives for October, 2013. 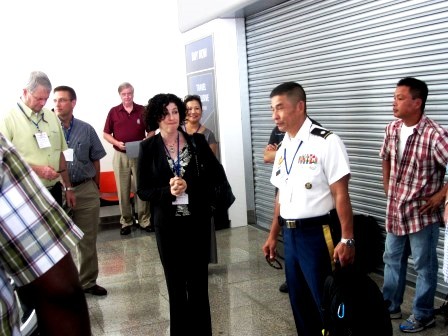 Participants in a recent Repatriation Ceremony, held at Da Nang Airport, included (Center) LTC Julian Tran, Commander of JPACs Detachment 2 in Hanoi, and U.S. Consul General Rena Bitter, from Ho Chi Minh City. Both are flanked by members of the Vietnam Office for Seeking Missing Persons. The transfer of remains was about to take place. If you follow JPACs repatriation efforts, leading to identifications of MIAs from past wars, then you already know that there are many ceremonies for fallen heroes, finally home from former battlefields around the world. I was privileged to attend a recent MIA Repatriation Ceremony that highlighted the first leg of their journey home from Vietnam. 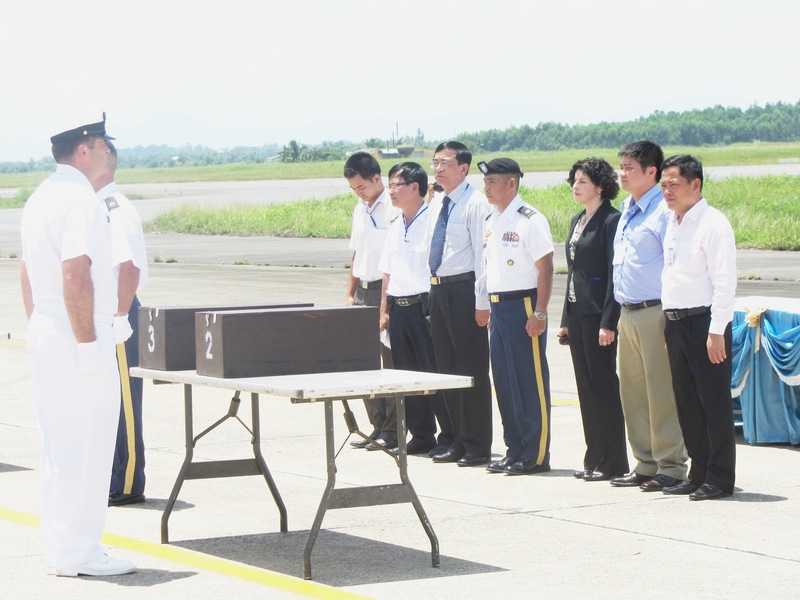 Here is a look at how JPACs Detachment 2 in Hanoi conducts this special send-off. 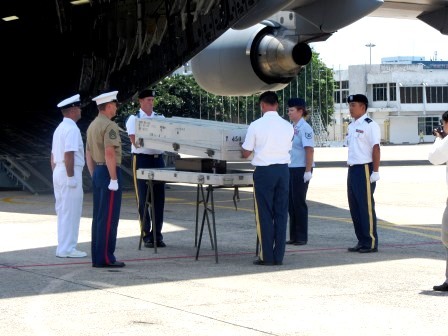 The remains of what JPAC hopes will be identified as our MIAs are now in the hands of the U.S. military — a beautiful sight. I arrived in country in early September 2013, at the conclusion of JPACs quarterly field operations. 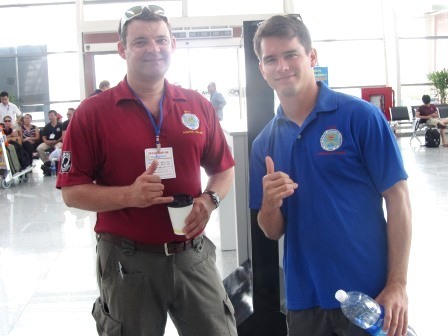 I had an opportunity to observe several teams, consisting primarily of military and civil service specialists on their way back to Hickam AFB in Hawaii. They were among an approximate 100 boots-on-the-ground in the Central Highlands that had spent nearly a month investigating and excavating several sites with the hope of repatriating as many of our Vietnam War MIAs as possible to the United States. Their successful efforts were the reason for the Repatriation Ceremony that I was about to observe. And although I was looking at three small wooden boxes, lined in red velvet, containing unidentified remains that hopefully belonged to American MIAs, I knew they did not come from the crash site of my first husband, Capt Jerry Zimmer and his radar intercept officer, 1st Lt Al Graf, whose site was excavated during those same quarterly field operations. As the former wife of an MIA still unaccounted-for, I also knew that three families, who had been waiting decades for a father, son or brother to come home, might soon have closure. Earlier on the day of the ceremony, a preliminary test, conducted jointly by a JPAC anthropologist and another from the Vietnamese side, determined that the remains were not Vietnamese, which cleared the way for them to leave Vietnam. It is important to note that the Vietnamese retain the remains after the test, until the handover takes place at the Repatriation Ceremony, which often follows on the same day, as was the case during my visit, or soon thereafter. Also, this test does not determine the identification of the remains, which is conducted later in JPACs Central Identification Laboratory at Hickam. Although Repatriation Ceremonies can take place at different airports in Vietnam, they usually are performed in the area where the majority of field operations are conducted during a particular quarter. I was truly honored to attend the Repatriation Ceremony, held on the tarmac at Da Nang International Airport – a location that was home to many Marine and Air Force fixed wing squadrons during the Vietnam War, including Jerry’s F-4 squadron, VMFA-542. 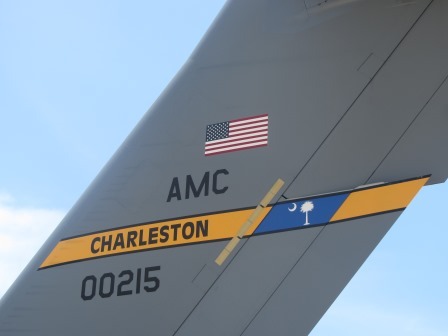 But instead of looking up at an F-4, I was focused on a large transport aircraft that would soon be filled with our military, escorting the unidentified remains back to the U.S. — possibly after being MIA for four decades in Southeast Asia. Despite the 90+ degree heat that bounced off the tarmac and left me looking and feeling like I’d run a marathon in a sweat suit, it was a humbling experience to be among the large gathering of team members, invited guests, diplomats, Vietnamese officials and JPAC’s military leadership and civil service employees from Detachment 2 in Hanoi. JPACs Det 2 was well-represented by Ron Ward, Kelly Ray, Buddy Newell and many others. Consul General Rena Bitter and LTC Julian Tran arrived in-country recently and both were attending their first Repatriation Ceremony with hopefully many more to come. The team leaders that worked on Jerry’s and Al’s site — great people! Since this was LTC Julian Tran’s first Repatriation Ceremony as JPAC Commander of Det 2, it was heartwarming to see him begin his tour on a successful note. Born in Vietnam, LTC Tran left as a teenager, traveling by foot and encountering great danger along the way, but ultimately became an American citizen and an Army officer. Tran’s goal during his two-year tour was clear: Bring them home, he told me, without blinking an eye. Flanked by U.S. Consul General Rena Bitter, newly arrived in Vietnam, attending her first Repatriation Ceremony, Tran was also accompanied by officials from the Vietnam Office for Seeking Missing Persons (VNOSMP). With assistance from a joint US military honor guard, the handover between the Vietnamese and Americans was brief but very dignified, as shown in the attached photos. I was proud to be an American and hoped that Jerry knew I was there for him, as well. Post Script: As I was preparing to leave at the conclusion of the ceremony, one of the Vietnamese officials that had participated in the handover ran over to shake my hand. Since we had a language problem, I asked Casualty Resolution Specialist Ron Ward to translate, and he told me that the Vietnamese Colonel remembered me from our visit to Jerry’s crash site in May, 2012. When the Americans and Vietnamese — which included the Colonel — were traveling to various sites last year, I was allowed to accompany them to Jerry’s and Al’s site. This wonderful opportunity enabled me to write about the experience and hopefully to give readers insight into the unbelievable challenges involved in repatriating our loved ones. Watching the three sets of remains being transferred to an American aircraft and then seeing the Colonel again, I found myself reflecting on the day of last year’s visit to Jerry’s crash site and was reminded of what it took to make this day’s Repatriation Ceremony happen. Pictured is the JPAC military team relaxing on the beach after 21 days in the Vietnam jungle, conducting the recent excavation of Jerry’s and Al’s crash site. 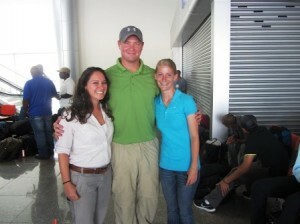 Civilian anthropologist Dr. Nicolette Parr (4th, L) and Team Leader Cpt. Steven Moebes, US Army (3rd, L), led the operation, working with the above military specialists from the joint services (USPACOM). Also pictured is JPACs Detachment 2 Casualty Resolution Specialist, Ron Ward (R), a dear friend to all Vietnam War MIA families. Schedules do not always sync up when traveling, but I lucked out during my visit to Vietnam in early September and connected with some friends – new and old – and several active-duty military teams and civilian specialists, many of whom were from the Joint POW/MIA Accounting Command (JPAC) at Hickam AFB in Honolulu, HI. The latter were in country to conduct quarterly field operations, primarily in the Central Highlands. The August/September time frame is generally considered the best for investigations and recoveries in that location – despite the oppressiveness of the heat. Initially I had no set plans to link up with the JPAC team assigned to excavate the site of my first husband, Capt Jerry Zimmer, USMC, and his Radar Intercept Officer, 1st Lt. Al Graf; however, as a solo traveler, I was able to rearrange my schedule to include a brief meeting with them in Danang, at the conclusion of the excavation. Not unusual for a crash involving a high speed F-4 Phantom, the debris field can be extensive and require several phases to complete. 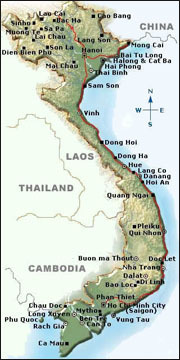 For newcomers to my blog, Jerry’s crash site is located approximately 20 miles southwest of Danang in the Que Son Mts. Jerry was the Section Leader on a mission to clear a landing zone in that area for a recon insert. He had just dropped his first bomb load when hit by 50 Cal machine gun fire, which is believed to have come from a cave in the nearby mountainous terrain. Neither Jerry nor Al were able to eject and both were declared Killed in Action/No Body Recovered and ultimately listed as Missing in Action. Dr. Parr could not be specific about a future excavation, but I do know that sites like Jerry’s and Al’s are among the toughest and most time-consuming. Early-on, LTC Todd Emoto, a former Commander of Detachment 2, described the mountainside site as exceeding the length of a football field, which said it all. As the only civilian among approximately 15 military team members, Dr. Parr said she was a little intimidated at the beginning of her first JPAC excavation, but that was short-lived. Her counterpart, Cpt. Steven Moebes, US Army, was the Team Leader responsible for U.S. boots-on-the-ground during the excavation. Cpt Moebes told me that every morning his team woke up with one thought in mind – maybe today is the day we will find remains. Also involved in the excavation were Vietnamese villagers and members of the Vietnamese Recovery Team (VRT). It was apparent that Moebes and Parr were a good team and respected for their leadership roles. Maybe it’s the writer in me, but whenever I visit Vietnam and have an opportunity to meet our military up close, it always reminds of why I am there and helps me cope with this very sad mission. The majority of team members come in all sizes, ages, ethnicities and specialties, but one thing they have in common is that they are members of our active duty military. We are fortunate to have an all-volunteer military of the highest caliber. When you look at the attached photo, please understand that our military serves the country in many different ways throughout the globe, and when deployed with JPAC to Vietnam, Laos, Tarawa, Burma, New Guinea or wherever else we still have MIAs, they are serious about the job and dedicated to bringing home our loved ones. If the team could have made Jerry’s and Al’s remains appear, they would have done it in a nano second, but it doesn’t work that way. I was so glad to have a face-to-face opportunity to thank them for their hard work. What happens next with Jerry’s case will be determined by JPAC and others within the accounting community. Although it is likely that the site will undergo a final phase, they will look at the evidence to determine the case’s continued viability. I am confident that JPAC will do the right thing. Many thanks to JPACs Detachment 2 Commander, LTC Julian Tran, USA. and Det 2 Casualty Resolution Specialist Ron Ward, both of whom facilitated my visit, which will be discussed at greater length in my next blog. 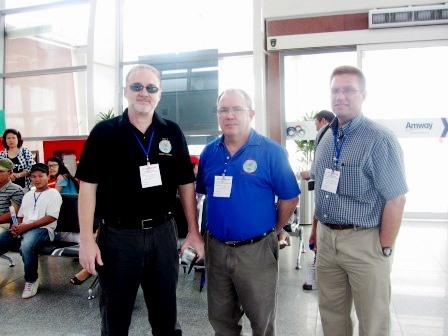 *Three sets of remains were found elsewhere in Vietnam and sent back to JPACs laboratory for identification. Sometimes it takes a while, but we are still finding Vietnam War remains, so no one is giving up!